Jenkins Garden, the new green space at the corner at Lockwood at Harrisburg, was recently planted with native trees and plants that will provide shade and a place for the public to enjoy nature while waiting for the bus or light rail.The garden, developed with the assistance of the U.S. Fish and Wildlife Service and the Brazoria County Naturalists Society, is designed for wildlife, specifically pollinators, including birds,butterflies and other insects, and includes a water feature. Native Texas grasses, shrubs, and trees will provide nectar, berries and seeds. The garden is named in honor of the Dr. Daniel Jenkins III family, who help fund the development of the park. The Jenkins’ are long-time East End advocates and owners of the Harrisburg Eye Clinic, which has a 40 year history of serving area residents. The Jenkins Butterfly Park map shows the trees, flowers, and shrubs that were carefully selected to attract butterflies, hummingbirds, and other pollinators. This information is provided so that similar garden-scapes can be created in neighborhoods throughout the city. The pdf. can be downloaded from the left side of this page. In Houston, butterflies can be seen almost year round, and there are about 100 different species found in the area. The secret to attracting them to your garden is to plant the correct plants that support the caterpillar (larvae) or the butterfly (with the nectar). Jenkins Garden has plants that are suitable for a variety of caterpillars and butterflies, as well as migrating hummingbirds. The following references provide more detail, but our friends at the U.S. Fish and Wildlife Service and the Brazoria Naturalists Society have done most of the research for anyone interested in a butterfly and hummingbird garden. Whenever possible, choose native plants. Native plants will attract more native pollinators and can serve as larval host plants for some species of pollinators. Most of the plants listed below are easily available in nurseries specializing in native plants. You MUST have a sunny location for these plants. Other requirements for a good garden are also a must, such as a well draining bed with good soil. Consult a generally accepted guide such as A Garden Book for Houston, by L. Herbert, for these basics. Forty-five students and faculty from Furr High School’s Green Belt group helped install the garden, which has become part of the network of sidewalks, trails, and parks that support pedestrian and bike activity throughout the East End. 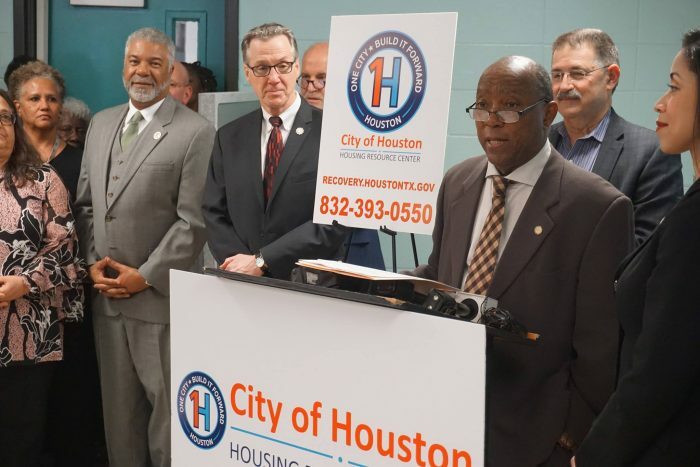 Funding for this project comes from the Connecting People with Nature grant, administered by the US Fish and Wildlife Service, and TIGER grant funding from the Federal Highway Administration. VWs repurposed! 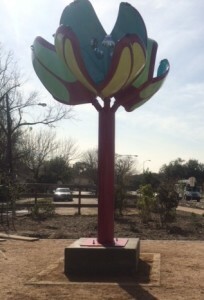 This sculpture by Amber Eagle, and present to Jenkins Garden by The Houston East End Chamber of Commerce, celebrates car culture and flower power in equal turns. Autoflora features petals made of vintage VW car hoods painted with bright automotive metallic paints. The contemporary artwork takes the form of colossal flowers, simultaneously incorporating aesthetic traditions from colonial Mexico while paying homage to urban low rider aesthetics from the 1970s.